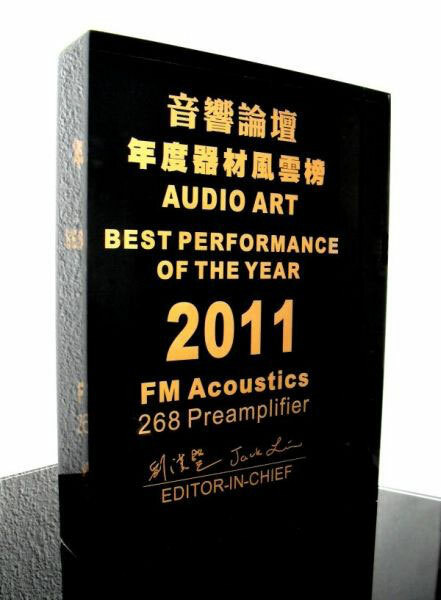 Gold Award FM 268 Line stage / Harmonic Linearizer - FM ACOUSTICS LTD.
"BEST PERFORMANCE OF THE YEAR 2011"
- and the FM 268 has been crafted continuously for no less than 10 years! This just proves once again how good an investment an FM ACOUSTICS really is. It was advised that this award is decided upon not just by a single person but is the result of polls from music lovers, listener's comments from the presentation at the recent high end shows and the verdict of a group of audio connoisseurs. With it's unique characteristics and built-in Harmonic Linearizer the FM 268 convinces everyone. It truly is one marvellous piece of audio jewellery.